For nearly 20 years, Snider’s Bros. Meats has been Salt Lake’s premier destination for quality meats, handsome butchers and friendly service. Snider’s is family owned and operated – maintaining the old-fashioned hands on approach. Their butchers have made careers in the meat business and want your guests to be as happy with your cooking as you are with their cutting. Snider’s can provide instructions for cooking many items, tips and tricks for cooking and suggestions for just about any meal. 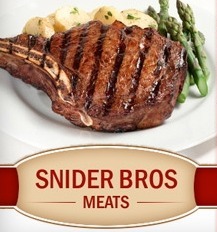 Snider Bros Meats is giving away a $50 gift certificate to one lucky winner!